How much will a Green Roof weigh? 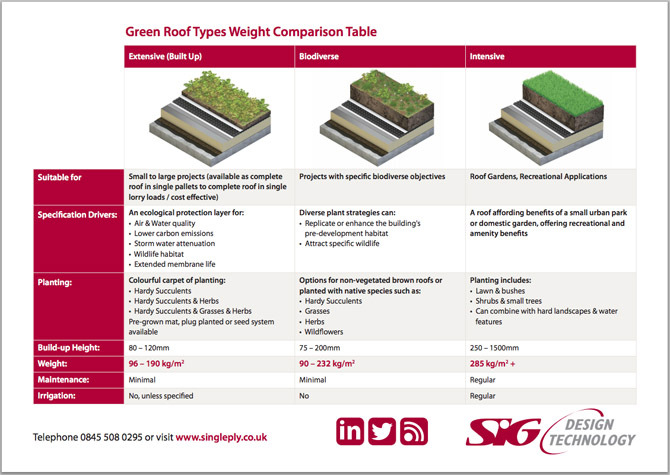 We’re often asked about the weight of a green roof, because it’s one of a number of factors specifiers need to consider when deciding which roofing system to use. Here’s a summary of the different types of green roof available. Extensive green roofs are designed to reap the benefit that green roofs offer at minimal cost and with very little maintenance. A shallow layer of growing medium supports low growing, stress-tolerant plants that can generally look after themselves. Built up extensive green roofs come in separate elements (drainage layer, growing medium, plant layer etc) that are installed on site. This makes them more cost effective than a modular system, and a range of weights and heights can be used. Planting can be pre-grown mat, plug plants or seeding, depending on your budget and other requirements. Our very popular Green Roof Kits are produced using the built up system. When they arrive our specification manager will build the roof for you. 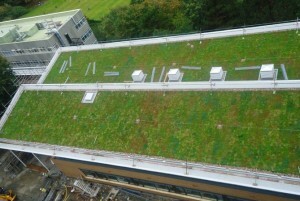 Here’s an example of one our our recently installed built up green roofs at Aberystwyth University. Biodiverse green roofs are low maintenance roofs designed to create or replace natural habitats. They can be specified to meet local Biodiversity Action Plans or to support specific flora and fauna, including Bats, Bees, Butterflies, Birds and so on. The weight of biodiverse green roofs varies according to the needs of the plant species required. 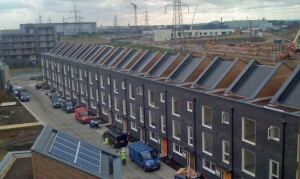 Our recently completed Barking Riverside project is a biodiverse green roof, plug planted with sedums and native species. If you want a garden on your roof, perhaps if you are hoping to plant shrubs and have a mown grass area, this solution is the most appropriate, but it is the heaviest and requires the same maintenance of any garden. Intensive green roofs are essentially ‘roof gardens’ and may also need to allow for the additional weight of paving and terracing, furniture and even trees. An interesting example of an intensive green roof is Manaton, the award winning private house on Dartmoor that uses local meadow grass to blend the family home into the landscape. Click on the image to visit the case study for this project. Will my roof require additional structural support? Whether newbuild or replacement, a structural engineer will need to design the structure of your roof and take into account the loading of various options. Share this post with him/her and ask whether additional structural support will be needed on your project. They are welcome to contact us directly for additional information. How can choice of green roof reduce costs? Your choice of green roof system can affect both the capital and operational costs of the roof. If you can reduce the weight of the roof this may reduce the need for additional structural support, depending on the existing structure specification. Equally, choosing a low maintenance extensive or biodiverse roof will reduce the need for ongoing operational costs. Have a talk to us about your requirements and we can investigate the options for you, free of charge. Read more about Green Roofs on the Green Roof section of our site. 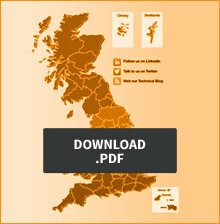 Download Brochures and Fact Sheets on Green Roofs. We provide a comprehensive design and supply service for our roofing products, so get in touch with details of your project and we’ll be able to give you further details including details, specifications, maintenance guides and samples. A full range of ways to contact us are available here. Thanks for the information! I’ve been thinking about having a green roof installed on my house ever since I first heard about it. I haven’t put much thought into whether it would need additional structural support on my house, so I’m glad that was discussed in this article. It seems like a good idea to ask the structural engineer who’s designing your roof whether it will need additional support. Now that I’m aware of the issue, I’ll be sure to keep that question in mind when I need to speak with a structural designer about installing a new green roof. Thanks, this guide is really helpful, going to download and use in presentations when we talk to clients. Hello, we’re afraid that seismic loading isn’t something we can advise on – earthquakes are very uncommon in the UK. We suggest you seek advice locally for this question. Thank you for what you said about our roofing blogs post. We looked at yours and it is one that we will follow as well.